15 Hot Spots for Celebrity Sightings in New York City #infographic ~ Visualistan '+g+"
New York City is a mecca for creativity, production, fashion, food, culture, history, nature, and so much more. It is no wonder that celebrities from all walks of entertainment flock to the Big Apple for work, play, and to call home. 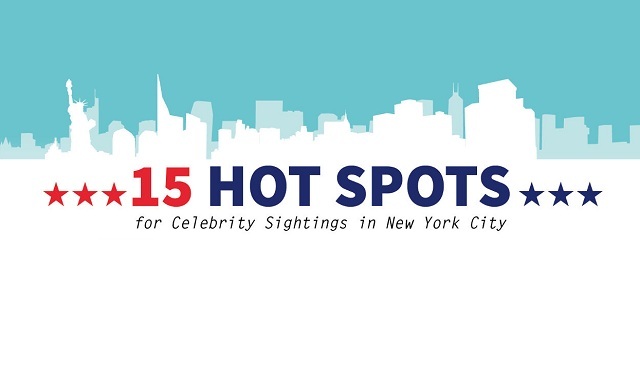 This infographic from NYC experts TopView Sightseeing highlights 15 hot spots that stars like Tina Fey, Selena Gomez, Johnny Depp, Jimmy Fallon, Rihanna, Demi Lovato, Helen Mirren, Chrissy Teigen, and Olivia Wilde frequent. Since there are so many television and film productions currently underway in New York City, this attracts talent from across the globe. Broadway shows also feature beloved stars like Daniel Radcliff, Denzel Washington, and Andrew Garfield. You can also dine among the stars at restaurants like O Ya, Lure Fishbar, Park Side Restaurant, and Coppelia. While you are strolling through Central Park and enjoying the natural oasis, you may find yourself breathing the same fresh air as celebrities who frequent the park for exercise and play. As always, be respectful and treat others as you would want to be treated. Celebrities are people too!